Flooded Basement? We can help! Flooded basement or water damage in your basement? We can help! Many of us have been there before - Headed to complete a load of laundry only to discover a flooded basement or water damage in areas of the basement. This can be an extremely stressful situation for homeowners and unfortunately can disrupt your normal lifestyle. Not only is water in your home an inconvenience, excessive water and moisture in the home may pose a health risk for occupants. Water also has a destructive effect on many building materials and contents. Effectively restoring a flooded Pittston, PA basement is essential for the home owner and occupants of the home. Properly restoring a flooded basement requires training, expertise and specialized equipment. In addition to understanding the technical aspects of water damage restoration, our team values and respects your home and belongings throughout the process. They will also keep you updated during the project on the work progression. It is important for our franchise to respond to the storm damage as quickly as possible to assess the damage. The length of time the water is in the structure before restoration begins is a very critical factor. If the water has been in the structure for an extended period of time, damage is much more severe. Even if the water was a clean source originally, bacteria, mold and other microbiological growth may create an unsanitary condition that poses a threat to the health of occupants of the home. 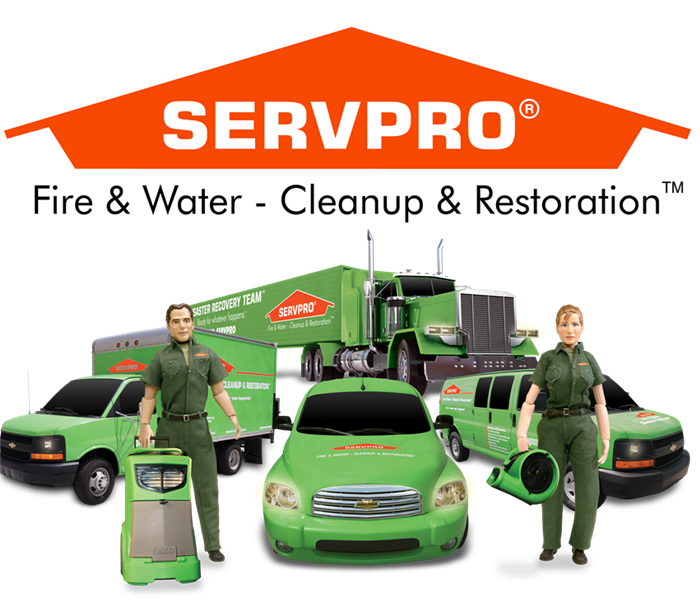 Our SERVPRO of Kingston, Pittston City and Wyoming County franchise standard requires specialized equipment and training. Our technicians are IICRC certified prior to beginning work within our franchise and trained to assess the damage on each loss location. We begin a storm damage loss by detecting the moisture trapped within the walls, ceilings, floors and other locations not visible from the exterior surface. Once the damaged area is identified, we extract any standing water, and then drying techniques are used to ventilate, evaporate and dehumidify the environment. 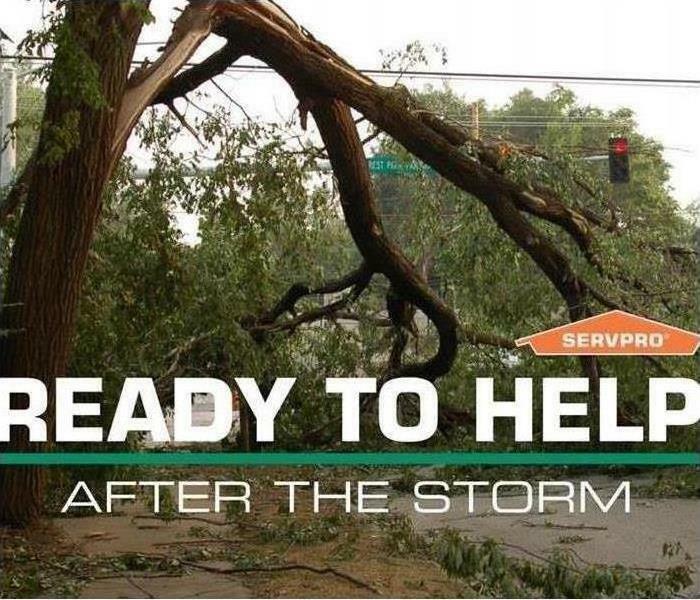 As warmer temperatures approach along with severe weather, we are here to help following a storm and damage that comes along with it. We can be reached 24/7/365 - 570-714-0090. 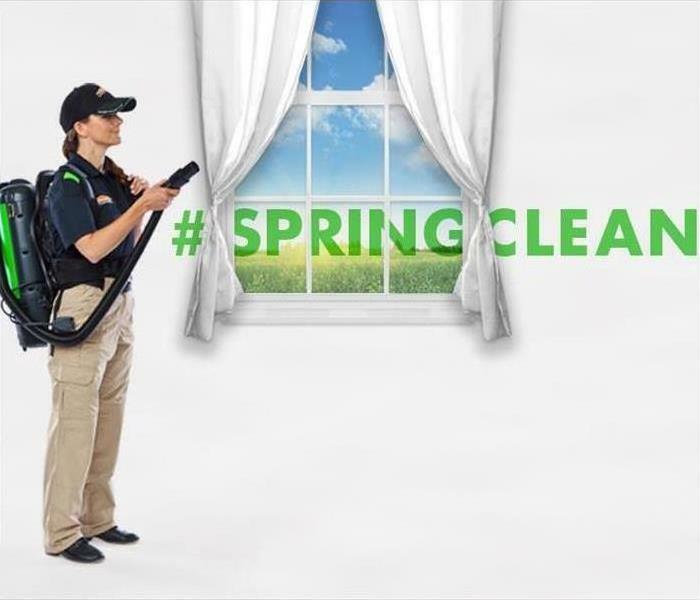 Call us to clean your HVAC system this Spring! Ventilation systems are often the biggest culprit in poor indoor air quality. You should frequently make it a priority to inspect the ductwork of your commercial property and home. This ensures the safety of your customers and/or residents. Keeping them clean can extend the life of the equipment. This can in turn save you money and give you cleaner air to breathe. 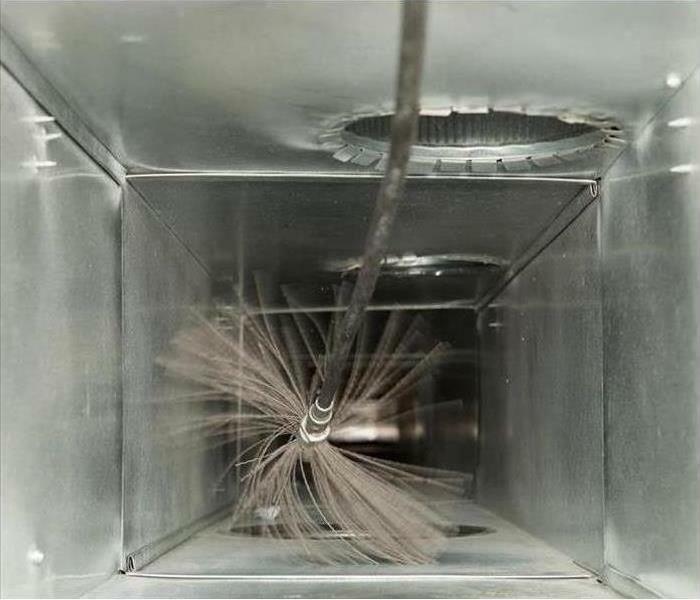 However, duct cleaning is not always necessary. We will make recommendations about the best way to address any indoor air quality concerns. This can save you money and provide peace of mind on the health of your system. How to prevent water damage in your Pittston City basement? 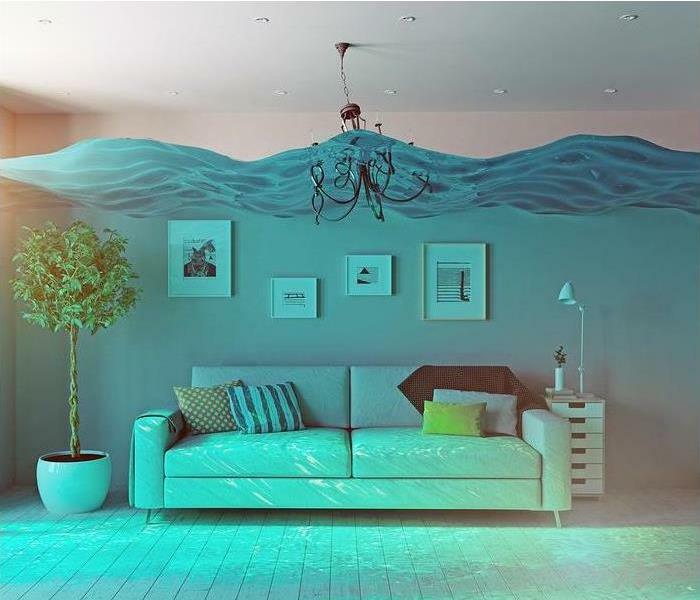 Is your basement under water? We can help! Has your Pittston home had issues with water in the basement in the past? Avoid another spring and summer of your home filling with water. Below are some useful tips to follow in order to keep your basement dry and safe. After winter's wrath in NEPA, most of us are ready for warmer temps and sunnier skies. Although that does sound refreshing, we can't leave out the fact that April Showers will be very prominent. 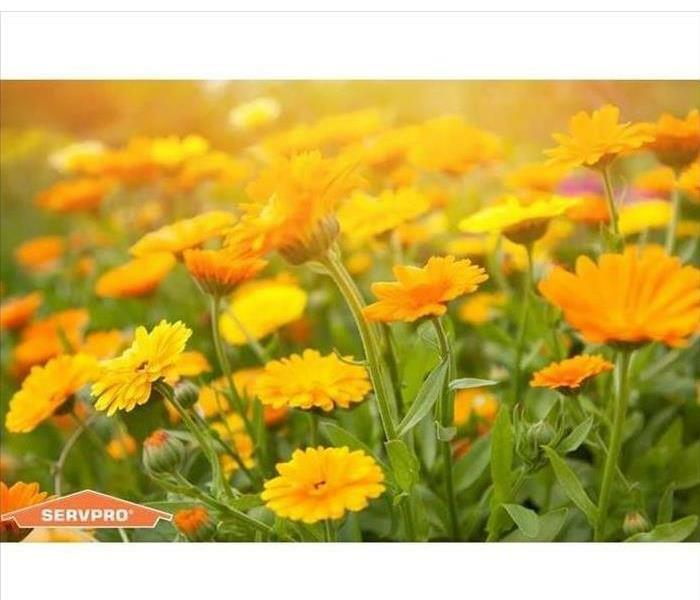 They do lead to May Flowers but could also lead to minor or severe flooding. Follow these tips below to avoid rain water entering your home this season. Wishing you a relaxing, safe and sunny Spring ahead! Remember, we are always here to help when needed. 570-714-0090. Do you have a home in the NEPA area? Do you even have a vacation home in the NEPA area? If the answer is yes to these questions, it is important to keep an eye on the safety of your property during storm season. As we head out of the frigid winter and enter into spring and the possibility of more storms, keep the following tips in mind to keep your home and belongings safe. If disaster strikes, we are always Here to Help. We can be reached 24/7 at 570-714-0090..
Cover all glass or delicate outdoor items and furniture. Close all windows and doors during a hailstorm. Put vehicles in the garage during hailstorms or cover with a thick blanket. Move flowers and flower pots under cover. Inspect home roofs regularly for loose or curled shingles (this also applies for wind). Properly grade lot to avoid water seeping back into house. Clear gutters and downspouts of debris to ensure proper drainage. Ensure downspouts are located and facing away from the house. Reduce air and water leaks with weather stripping around doors and windows. Locate and seal any cracks in foundation walls and basement floor. Replace rock and gravel landscaping material with shredded bark. Install impact-resistant shutters over large windows and glass doors. Secure all moveable outdoor items or relocate them indoors. Keep trees and shrubbery trimmed and remove weak trees that may fall. Avoid parking vehicles near or below trees, lampposts or power lines. Secure all HVAC units, skylights and pipes to avoid being blown away. Life happens. Kids spill drinks, pets have accidents and homes get dirty - especially during the winter months. We have the expertise to provide a deeper clean than your basic house cleaning service. The residential cleaning services performed by us will not only ease the burden of the constant maintenance of your home, but will also create a safe, clean and comfortable living environment for you and your family. 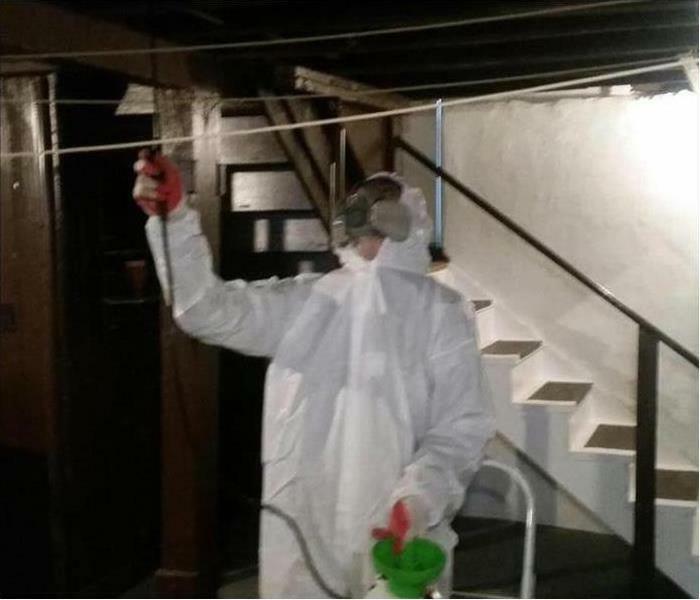 SERVPRO experts are ready to assist in the clean up of sewage and other biohazard materials and provide deep cleaning services for your home. Find out more about our franchise professionals. Found Mold in your Commercial Building? In the process of selling a vacant property? Avoiding mold will aid in the quickness of the sale. Since mold loves moisture, it’s important to remove sources of water to prevent it from growing in the building. Roof Leaks: Check attic or top floor for roof leaks, and repair any that are found. Tis' the season many are utilizing their space heaters to stay warm during the frigid winter months. Although comfortable and cozy, space heaters can cause a significant increase in home and business fires. Space heaters are the type of equipment most often involved in home heating equipment fires, figuring in just over two of every five fires (43%). Significantly, the fires involving space heaters accounted for 85% of the civilian deaths and 78% of civilian injuries in home fires caused by heating equipment, as well as over half (53%) of direct property damage. Below are a few safety tips you can reference if using a space heater in your home or business. Place space heater on flat level surface. Don't put on shelf or high traffic areas. Only use space heaters that are nationally recognized in a testing lab. 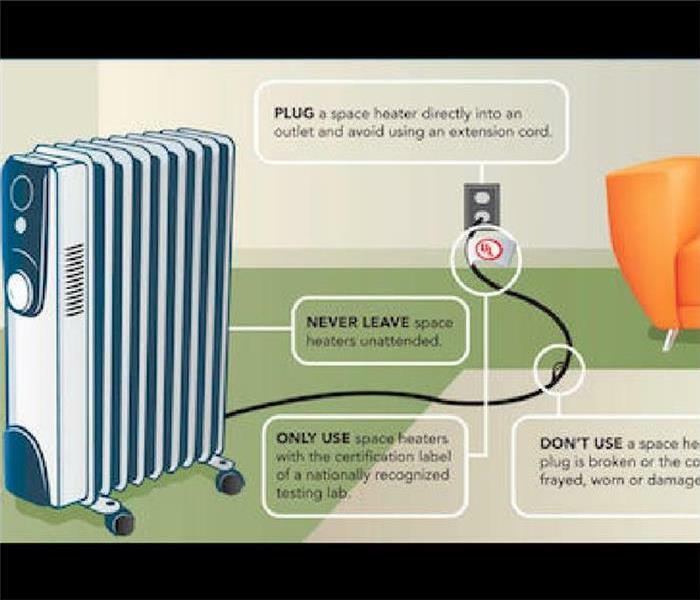 Don't use a space heater if the plug is broken or the cord is damaged. Keep your space heater at least 3 feet away from flammable items, pets, and children. Do not use around water. We help restore your business back to pre emergency condition. 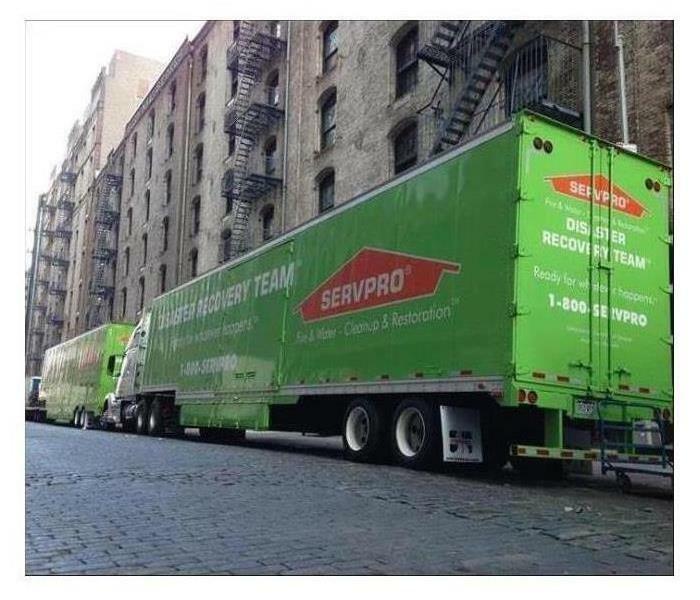 If your business has suffered commercial water damage, SERVPRO of Kingston, Pittston City and Wyoming County will get you back up and running again. Call us anytime 24/7 at 570-714-0090 for fast help. 3/21/2019 - How to prevent water damage in your Pittston City basement? 2/5/2019 - Found Mold in your Commercial Building?